This one’s a complicated story, and it doesn’t have all its parts in place, but let’s begin. …who his father is. [He still doesn’t get to know, actually, but what the heck]. It turns out that Ranjit’s father was misled by some unnamed individuals into believing his wife unfaithful – this when she was pregnant with Ranjit. Ranjit’s father turned her out of the house, and since then, she’s been living in this village, where Ranjit has been born and brought up. Ranjiy vows to take revenge against his heartless pa – but where is he to be found? The dying old lady only has time to gasp out, “Phool Haveli. Balrampur,” before she cops it. Ranjit now has an idea of where he should go to search for his father, but he doesn’t know his father’s name. [Thankfully, though, he does know his dead mother’s name: Parvati]. So Ranjit sets off for Balrampur, on the way thrashing various villains and rescuing their hapless victims. One of these victims is Ustad Puran (KN Singh), who happens to be a big shot in Balrampur. Ustad Puran is very grateful and even takes Ranjit home, so that both Puran and his wife Laxmi (Praveen Paul) can personally thank this man who saved Puran’s life. En route to Balrampur, Ranjit also stops by to repair the broken carriage of Padmavati (Mumtaz), the princess of Balrampur, who has been out driving through the jungle with her maid. Where Puran had been merely very grateful, Padma is more than grateful, and quickly falls in love with Ranjit. This is where things began to go very haywire for me. The scenes switched faster than I could keep track of them, and I ended up spending the next hour or so of the film rather lost. So, instead of a synopsis, a quick gist of who loves who, who hates who, and who has what up their sleeve. The king, Padma’s father (Munshi Munaqqa?). He is a bit of an oddball – he prances around like something out of a cartoon strip, makes faces and generally acts the idiot, but seems well-respected and pretty much in command of what’s going on in his kingdom. He has declared that at a certain festival in the offing, the champion who wins all the tournaments will be declared the ‘Rustom-e-Hind’. (e)… and has a buffoonish, stuttering servant called Madho (Maruti) – who is sweet on Padma’s maid, Jharna (?). Jharna herself would much rather encourage the attentions of Mohan (Mohan Choti), who is Padma’s coachvaan (coach driver), and is very much in love with Jharna. 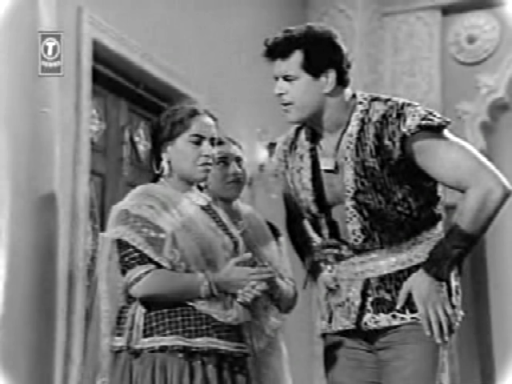 … and Madho, anyway, is being assiduously pursued by a maid (Tuntun) who works at Ustad Puran and Laxmi’s house. Into this hotchpotch of characters comes Ranjit, asking around for Phool Haveli. His initial enquiries are greeted with universal hoots of laughter, but after a while, he is taken to Phool Haveli – and discovers that it is a brothel. Besides a couple of good song-and-dance sequences (one picturised on Helen, the other on Laxmi Chhaya), we don’t get to see much of the seamy side of Phool Haveli. It does emerge, though, that Bhimsen and his crony Vikram, along with their attendant gangs of hoodlums, frequent Phool Haveli, and have been trying to carry off one of the girls, much against the wishes of the madam. Ranjit, blundering in on one of these attempts, rescues the girl and puts the villains to rout. The madam is grateful, but not enough to let a now-desperate Ranjit know who the owner of Phool Haveli is. Ranjit is tenacious, though, and tries to surreptitiously find out more. He comes, disguised as an Arab, to Phool Haveli – and runs into an old acquaintance: Ustad Puran, who has found out that Bhimsen has been pestering the girls of Phool Haveli. In the course of their conversation (Ranjit reveals his identity soon enough), Ranjit says that he’s looking for his father. He tells Ustad Puran what his dying mother had said and, on being asked, tells Ustad Puran his dead mum’s name – and Ustad Puran looks stricken. [Yes, I can guess where this leading]. All Ustad Puran does is to tell Ranjit that he, Ustad Puran, knows Ranjit’s father well. He will introduce Ranjit to him someday soon. Then Ranjit can take revenge for the shabby way in which his pa had treated his mother. (b) Ranjit inadvertently comes to know that Bhimsen – Ustad Puran’s son and the senapati – has been responsible for several murders, besides trying to get girls from Phool Haveli. Ranjit tells Ustad Puran this, but while Ustad Puran (who has anyway been telling Bhimsen to mend his ways) is thoughtful, Ustad Puran’s wife Laxmi is outraged, and tells Ranjit in no uncertain terms that he’s a dimwit who’s got his facts all wrong. What next? Who is Ranjit’s missing father? [If you’ve seen even half a dozen old Hindi raja-rani films, this is one question to which you will almost certainly know the answer]. Will Bhimsen ever get his just desserts? Will Ustad Puran and Laxmi get around to acknowledging that Bhimsen is not the goodie-two-shoes they imagine him to be? Who will be declared the Rustom-e-Hind? [Yes, well. That is sort of obvious, too]. Mumtaz! Okay, I said this before, in my last review, but I’ll say it again: I adore Mumtaz. She’s so alive and vivacious and lovely. She doesn’t have much to do here except look pretty and occasionally give Bhimsen the set-down he deserves, but still: she’s a pleasure to watch. 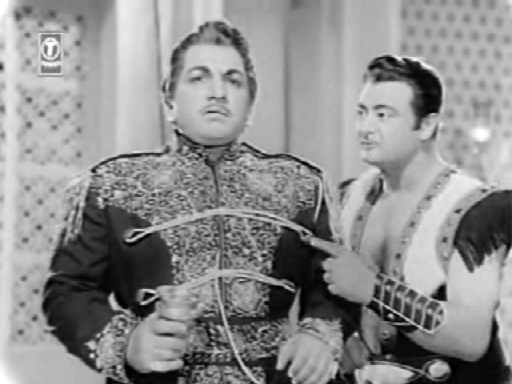 Dara Singh. I have to admit, I don’t recall watching any old Dara Singh films before this one, and I was a little wary of this because I’m not too keen on endless bouts of wrestling. While Ranjit was not typical ‘hero’ material (lots of brawn, but very little brain), he was endearing in a sweetly-lumbering-giant way. And while I’m not a fan of Hindi spoken with a broad Punjabi accent, his accent was cute enough to be quite forgivable. A lot of the songs. The music of Rustom-e-Hind is by Hansraj Bahl (a much underrated music director, even though he composed some wonderful songs). Among my favourite songs is Rajaji tore raaj mein, Nazar meri badhi idhar se [now that, if I’d only heard it and not seen it, wouldn’t be a song I’d at all associate with a historical raja-rani film! ], and Mere pehloo mein aake baitho. 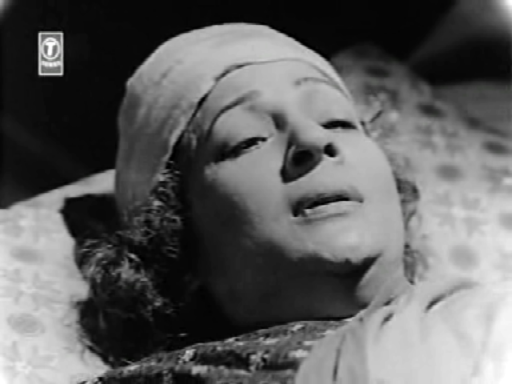 Interestingly, one of the three people who are onscreen singing Ek Majnun thha jahaan mein… rakh lo khidmat mein is Tuntun – I wish Bahl had given her a comeback song and revived the all-singing Uma Devi for our listening pleasure (the female voice was Minoo Purushottam’s). All repeated with very little imagination, again and again, with very little room for anything else. Except, of course, the songs and the many bouts of wrestling – the latter, too, getting on my nerves after the first couple of bouts. By the way, if you want to know the back story – why a seemingly good man like Ustad Puran threw poor, innocent Parvati out; who (and why?) instigated him in the first place; why he later realises Parvati’s innocence, and how Bhimsen is finally punished – don’t bother seeing this film, because the scriptwriter seems to have been too exhausted by the end to bother to deal with all of that. Rustom-e-Hind would have benefited from a much better script. The story isn’t bad in its basics; but it falls down badly in its execution. Sad. And Maruti’s act as the stuttering Madho? Not funny at all. On the other hand: don’t these two look charming together? 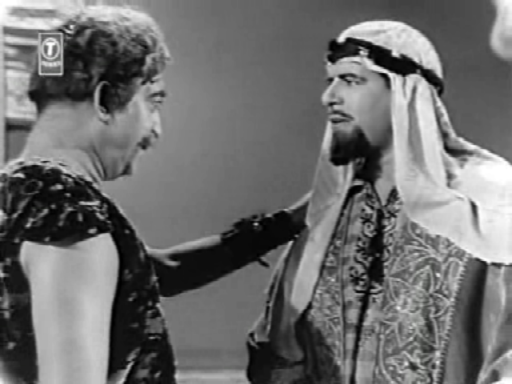 Dara Singh’s films had quite a following, although they were then rated as C-grade films. Going through your review I had a sense of deja vu for the story was similar to the action packed A-grade films of the 70s and 80s featuring top actors like Amitabh and Vinod Khanna. Those 70s’ Amitabh Bachchan-Vinod Khanna films – the Amar Akbar Anthony or The Burning Train style stuff – was chockfull of entertainment, wasn’t it? And invariably very good music, too. Rustom-e-Hind would’ve been much better if it had been better scripted, as I mentioned – it had lots of scope, and the songs were a treat! Madhu, I ended up laughing halfway through your synopsis.! Thanks for warning me off this one. 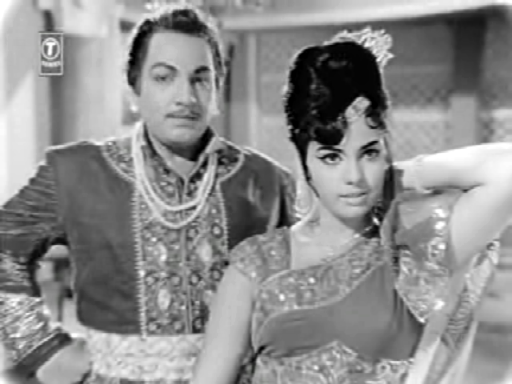 Mumtaz started off as an extra; and later played the ‘saheli’ to some of the top heroines of the time, including Sharmila Tagore. Can’t believe that in a few short years, she would be considered Sharmila’s rival! Well all said and done, all the ladies here sure look very pretty!! They are, they are! 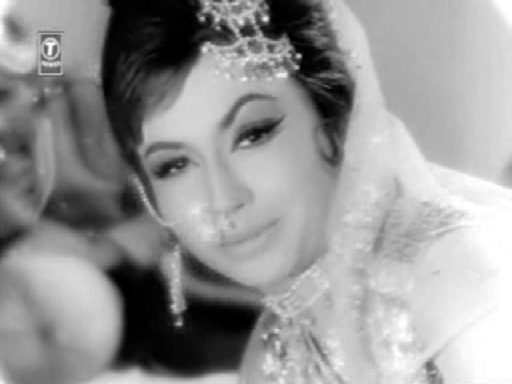 Especially Mumtaz – she’s a dream. 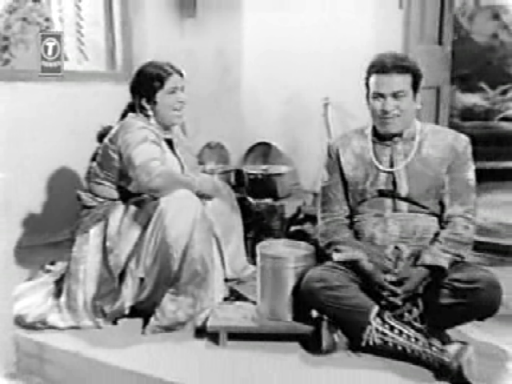 I wish Helen and Laxmi Chhaya had been around for a little longer (oh, and did I mention: there’s a Madhumati dance too, right at the start of the film)? If you watched it on a vcd it’s probably a badly chopped up one :) I have a dvd, although they are often made FROM the vcd, but I don’t remember it being incoherent at all. I loved this film, and what I really remember (besides Mumtaz’s sparkle) is Laxmi’s dance number—one of my favorites of hers. 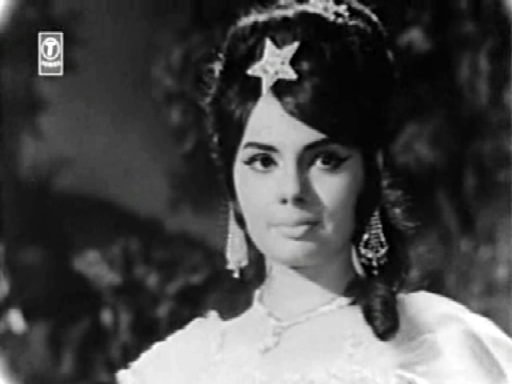 Yes, I loved that Laxmi Chhaya dance number, too – certainly one of her best, though I’d never have guessed that very sixties pop tune (not to mention her dancing) were from a ‘historical’ film! Ah, so did your DVD fill in the gaps about why Ustad Puran Singh was repentant about what he’d done to his first wife? 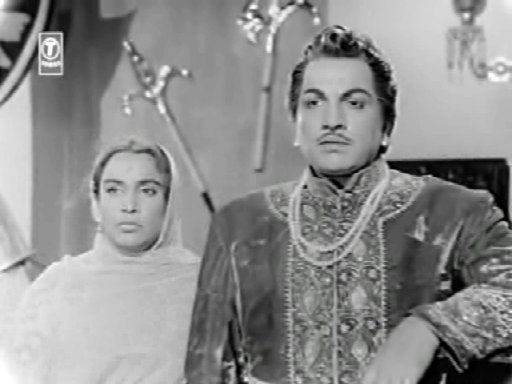 And did anything suitably ugly happen to the evil Bhimsen (come on, Hindi cinema cannot have a murderer and villain like this go scot-free simply because the Rustom-e-Hind turns out to be his elder half-brother!) I didn’t like those flaws in the script, or the haphazard way in which the story jumped about between the different people in the plot… I’d have liked for it to have been more focussed, and for the comic side plot(s) to have been less meandering. As long as it has lovely songs and dances… I guess one could watch it. This film came way before its time! But looking at him (the king), one should be grateful, that he his so much generous to men better endowed than him! And that puts poor Mohan Choti in the pangs of the Satan of unemployment! Nahiiiiiiiiiiiiin! Oh, does he? I wonder where they sell such disguises? If he were in the US Dar would have sued him. is this the clue to your next post? I think the subplot of Maruti loving the maid loving Mohan Choti, who is the ‘coachvaan’ (you made up this word or did they use it in the film?) as a good plot. They should have made a film on it and appointed OP Nayyar as the MD and we would have lots of songs with tanga-sound! :-)) You always have an interesting commentary to provide on my posts, harvey! 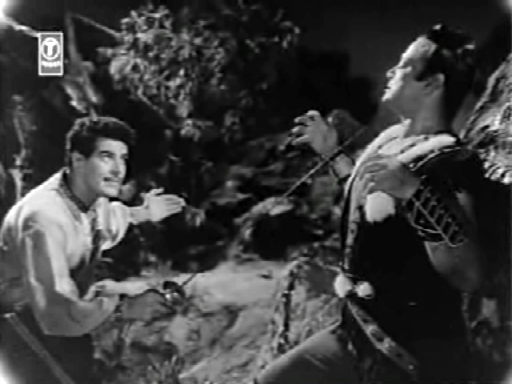 The coachvaan, by the way, is what Mohan Choti (and later, Dara Singh) is called in the film. It’s like gaadivaan, you know – a sort of Hindi-English fusion in this case, I guess! I do wish they’d made the ‘Mohan Choti-Maruti-Tuntun-Mohan Choti’s father and uncle-unknown actress who played Jharna’ section into a separate film – their scenes intruded too much here, when I’d have been more interested in learning more about Ranjit and Puran Singh and Puran Singh’s past and Bhimsen’s evil-ness. No, unfortunately Hansraj Bahl is not the link connecting to the next post… (hint: think genre!) Incidentally, we’re drawing closer to the end of this ‘linked posts’ business. Another four posts, and I’ll be done. 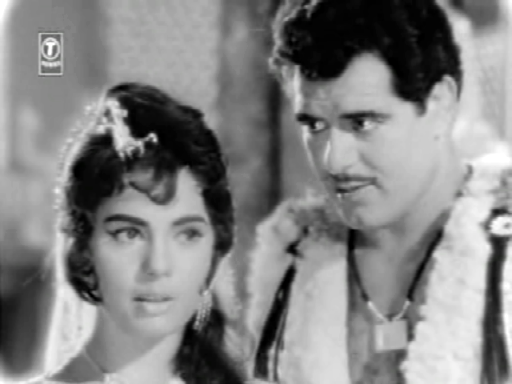 This too is from 1965 (the film was Sikandar-e-Azam – haven’t seen i, but I believe this one too had Dara Singh in it). 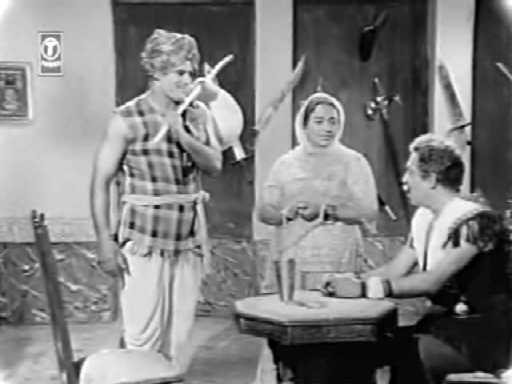 I meant the film, Anu – I have seen the song (on Chitrahaar and more recently Youtube), and do know that Dara Singh at least doesn’t feature in the song. 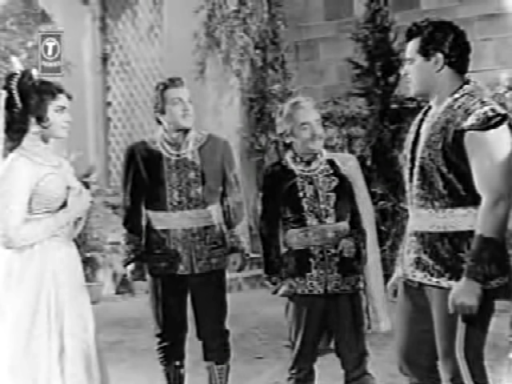 Interesting that Prithviraj Kapoor played Porus here – he was Sikandar in the (was it 1936) film, Sikandar. I haven’t seen that either, but I’ve seen a couple of scenes from it, and he’s pretty awesome. Sikander was very good, actually! Surprisingly so! 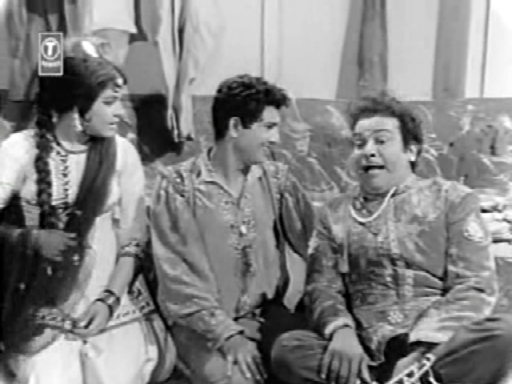 And the Sohrab Modi – Prithviraj Kapoor combination was brilliant! PK was the sort of scenery -chewing thespian who needed an equally strong co-star to match him in histrionics. Now I do need to get hold of it and see it! that is what I was thinking. but I won’t say more. main chup rahunga! bhanda thodi phodna hai! I don’t like jahan dal dal pe sone ki chidya. it makes me think of heavy, flightless, golden birds sitting on trees, which are creaking under their weight. And that is not how I envision bharat desh. And when one sees the king and his princes rolling around in heavy gold, one wonders if they are menat by the word ‘sone ki chidiya’. But then the would be very rotund and heavy chidyas! Give me Sohrab Modi’s roaring Porus to Prithviraj’s dashing Alexander anytime than the nylon and cardboard clad kings and kingpins of Sikander-E-Azam! Yesterday, I was watching Benazir and can you imagine, nobody goes OTT, even though they have lots of opportunities, what with misunderstandings and triangles and hexagons and all. Characters even speak out and clear misunderstandings in the middle of the plot and not on their death beds. The only melodramatic scene is the ending and that is also so subdued, that one feels cheated! Love the elegant title Rustom E Hind instead of Rustom of India. Dara’s wrestling bouts are the main reason why I have avoided his films though lately I have watched a few films online…incompletely. I find his Punjabi accent during romantic scenes quite endearing. So you also have the knack of watching films incompletely! In the last few days I did that with two gem of a films. Patther Panchali and Shatranj ke Khilari. But then I had to work! Punjabi accent is quite endearing if one doesn’T have to listen to it the every day, like poor dustedoff has to do it living in Delhi! LOL about DO in Delhi with punjabi accent. I’m picturing it. Actually, I was thinking about it yesterday, and I realised that I really don’t come across too many atrocious Punjabi accents these days in Delhi… perhaps Delhi’s become more cosmopolitan over the past couple of decades, or perhaps Punjabi accents of people who’ve lived here for a while tend to get diluted. But what I can’t abide with is the widespread belligerence and ‘every man for himself’ (or woman for herself) attitude amongst a lot of Delhiites. It’s generally better in the older parts of Delhi – Shahjahanabad, for instance, but you get to see some really shocking examples of rudeness and ruthlessly selfish behaviour in much of New Delhi. Talking of Hansrah Behl, he and G S Kohli are two really really underrated music directors. You mentioned two good road songs in one of the comments to Mere sanam post. Here’s another good road song set to music by Hansraj Behl. There are a couple of very nice songs in this film. The one from Dara Singh the Iron Man (whew!) is good too – very Punjabi, no? Enjoyed the review, Madhu. Thanks. Through much of this post, I had a sense of deja vu about the movie. The name also felt very familiar. And then I realised that I haven’t seen this particular film but have seen a couple of Dara Singh movies with broadly similar storylines/characters (e.g. Maruti in “Thief of Baghdad”). A Dara movie you could consider watching is Samson. 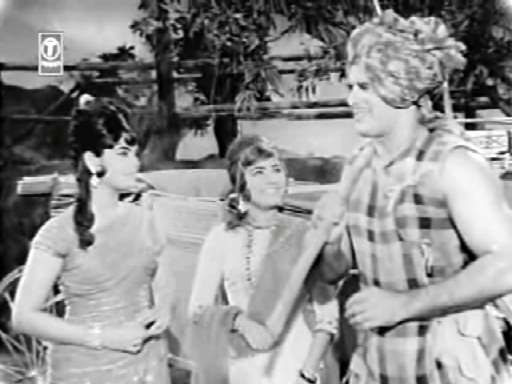 Dara-Mumtaz-Ameeta-Feroz Khan. The storyline is no great shakes but it has lovely songs which deserve to be much better-known than they are. And some of the special effects are pretty good too, for that time. Thanks once again for this review. And thank you for the Samson recommendation, Raja. I’ve heard of it, but (after having seen Rustom-e-Hind), I wasn’t especially planning on looking out for it. But the cast appeals to me, and I’ve been checking out some of the songs on Youtube (right now, I’m listening to Ek baat hai kehne ki) – and yes, I’m going to be adding this to my to-watch list. Thanks for introducing Hansraj Bahl. I had not heard of him before. Fun review too! Thank you, kenjn60! I’ve added, in one of the comments above, another very well-known composition (Mohabbat zinda rehti hai, from Changez Khan), which is also Bahl’s. This is a wonderful song from Miss Bombay. Heard it a million times on Vividh Bharti. I don’t remember having heard that one before – but it’s beautiful, very restrained. And I am always partial to songs where the singer’s voice provides much of the music – where he/she isn’t drowned out by the instruments. This one’s like that – Rafi’s voice is allowed to dominate. Thank you for sharing that. Totally OT here, Madhu, but how are things in Delhi? Are you and yours okay? That is so thoughtful of you, Anu! Thank you – we’re all well. Didn’t know about the blast at the High Court till this morning, but the earthquake last night really shook us up. Wow, it never rains but pours, huh? Glad to know you are fine. And it’s literally pouring rain, too! ;-) – enough to cause waterlogging in the lane outside our house, and enough to make going out a very messy affair.